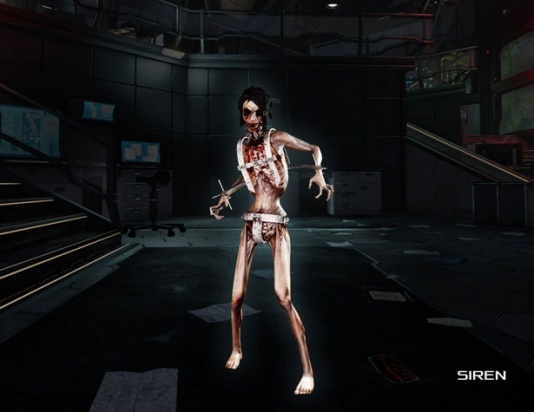 The Siren is an uncommon specimen in Killing Floor 2. It is classified as a medium enemy. Sirens appear as anorexic and skeletal females, lacking eyes and features. They also wear a metallic harness over their body, which serves as a crude bulletproof vest. Most distinctively, they have a sonic amplifier device embedded in their throats, allowing them to unleash bone-chilling screeches that damages and visually disorients players within range. Siren will not initiate a new scream if player get closer than 130 units. Scream attack can be interrupted. Sirens move slowly when docile, and sprint when enraged. On higher difficulties, Sirens have a chance to enrage upon sighting the players, and have a chance to enrage when shot. Should sprint if can sprint when damaged AND damaged (i.e. if sprint chance met its value) AND if distance to player laying between 6 and 12 meters (600 units < distance < 1200 units). Should sprint when frustrated. The sprint speed is equal to the walking speed. Sirens have a wide range of resistances, and no weaknesses. Sirens have no ballistic weaponry resistances, but interestingly, have one special weakness to the Double-Barreled Shotgun. Sirens have 2 weak spots, which are the head and the neck. Sirens wear a metallic plating over their bodies, which reduces the damage when they are shot in the chest and hips, acting as a crude bullet-proof vest. Note that damaging them in the neck is not the same as damaging the head; Damaging the neck will subtract from the body health, not the head health. The Siren is a glass cannon. It is a slow-moving, area of effect damage ZED. Upon spawning, it will walk towards the nearest player. Upon getting close to a target, they will begin to attack by screaming. Siren screams deal massive damage which increases based on how close they are to the player. Siren screams will stack with other Sirens and deal damage separately. Siren screams visually distort the area around them and cause players' screens to shake violently depending on how close they are to players. Siren screams destroy grenades and explosives (including C4 that has been placed on the ground), unless used by a Demolitionist with the Siren Resistance skill. After screaming, the Siren has a short cooldown time before it can scream again. 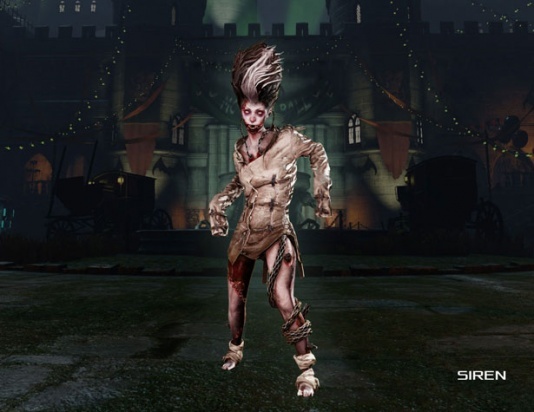 If a player is standing right in melee range of a Siren, it will attempt to scratch or bite instead of scream, though sometimes it will scream regardless. On Suicidal and Hell On Earth, Sirens do not gain any additional abilities. (PvP) Rally boost: forces AI Sirens to sprint, players do x1.2 more damage. Damage to doors = 39. EMP effect (disrupt) prevents Siren's scream attack. Scream attack considered as an explosion with the "Sonic" damage type. Each scream attack is a group of 4 sub-attacks performed in waves. Each sub-attack creates an anti-projectile shield that lasts for 2.2 seconds. Scream cooldown timer begin with the first wave of each scream attack. Siren will not initiate a new scream if player get closer than 130.38 units. Visual effect of scream attack - 6 seconds. Scream attack completely ignore the armor and does damage to the actual health. The Siren is deceptively durable despite its lanky build and looks. This is largely due to the metallic harness that they wear over their bodies which absorb damage. Sirens are extremely dangerous specimens and are capable of killing entire teams quickly when too many of them are left alive to scream in melee range. Sirens move very slowly, and therefore should be taken care of from a distance long before they have a chance to scream. The presence of Sirens also disables the use of explosives, which can prove deadly when a horde of ZEDs are traveling with Sirens in the pack, who can scream to prevent explosives from easily taking out a group of ZEDs. Sirens can be easily killed by perks that use high powered ballistic weaponry from a distance. Namely, the Commando and the Sharpshooter, who both excel at killing Sirens from a long distance safely. Support Specialist can take out Sirens relatively well at medium to close range, but they risk taking damage from screams. However, one shotgun blast to the head usually decapitates them instantly. Interestingly, the game encourages Support Specialists to get up close and personal with the Siren, especially with the Double Barreled Shotgun's increased damage multiplier, to kill them. The Berserker has no choice but to tank the scream if they are engaging Sirens. However, one well-placed strong attack to the head usually kills them instantly as well, stopping the scream immediately. Berserkers can also wait for the cooldown between Screams to attack. Demolitionist can exterminate Sirens the quickest with their powerful explosive weapons that do not require perfect aim. Once a Demolitionist acquires the Siren Resistance skill, they can quickly and reliably dispatch even groups of Sirens with their high powered explosive weapons. Before then, try to only shoot at Sirens in between their screams. When faced with groups of Sirens, it is often wiser to clear a path and back off so you can kill the Sirens safely from a distance, rather than risk getting surrounded by Sirens in every direction. A wipe is almost guaranteed if there are multiple Sirens screaming at the same time among the team, as the damage done by multiple Sirens stack.